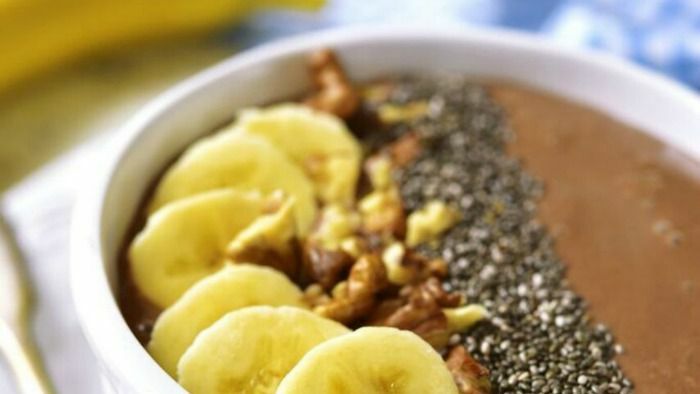 This recipe features one of our favorite food trios in just one bowl: bananas, almond butter, and chocolate. Let's be honest, Jillian Michaels is serious #fitnessgoals. So when she releases some healthy recipes in her app, we take notice. One of our favorites? This recipe that features one of our favorite food trios in just one bowl: bananas + almond butter + chocolate. You can expect just the right amount cacao nips and cocoa powder to satisfy your sweet tooth naturally, and the almond butter and protein powder will keep you feeling full until lunch. Blend the almond milk, banana, ice, almond butter, cocoa powder, protein powder, and vanilla extract until smooth. Transfer to a bowl and top with the cacao nibs, granola and coconut.